As an Australian sporting icon and community leader Michael Long has been at the forefront of creating a more united Australia. Long came to prominence as a footballer of remarkable ability, representing Essendon with distinction for 13 seasons. Long has since moved on to numerous community projects and is heavily sought as a keynote speaker and ambassador. The Long Walk, an initiative started by Michael when he decided to walk from his Melbourne home in November 2004 to meet Prime Minister John Howard in Canberra, received tremendous support. Wins: Today, Long is a source of guidance as he helps drive numerous programs designed to improve our nation. Long developed his football with legendary Darwin club St Marys, before winning the Best and Fairest at SANFL side West Torrens in 1988. Drafted by Essendon with selection 23 at the 1988 National Draft, Long made an immediate mark with the Bombers, winning the Best First Year Player award. Four goals in Essendon’s Qualifying Final over Geelong showed Long would be a finals player to be reckoned with throughout his career. Recognition: The 1993 season would see Long put himself in the history books, winning the Norm Smith Medal in the Bombers Grand Final win over Carlton. 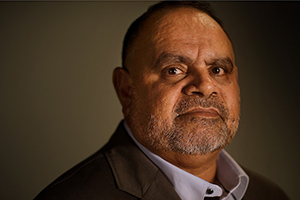 Long’s effort, in the International Year for the World’s Indigenous People, received widespread recognition and elevated the Essendon wingman to a new standing. A knee injury in the 1994 Pre-season saw Long miss the entire season, but he returned in fine style to earn selection in the 1995 All-Australian team. Playing as a permanent forward late in his career, Long would become a dual Premiership player in 2000 as part of Essendon’s record breaking team, before retiring the following season. Long Walk: The 2006 Long Walk, launched as part of the Dreamtime at The G’ AFL match between Richmond and Essendon, attracted thousands of Australians who walked together in a statement of strength, leadership and inspiration. The match has since become a yearly tradition attracting big crowds and importantly recognising the Aboriginal contingent in the AFL environment. Long has also worked hard to improve the lives of youth nationwide as the AFL’s Indigenous Programs Manager placing emphasis on addressing character development.